This is the message that Google gives whenever we sign in to YouTube. We know how this happened. Now we want to choose Business account forever instead of each time we sign in. How do we choose Business Account and then have Google remember our answer forever? Edit: Add the "Learn More" info. It explains how we created the conflicting account and not how to resolve the situation. Edit: Add the result of choosing "Individual Account:"
What is a gtempaccount.com email address? know any information about that account's creation. If you need to recover your individual account's password, follow these steps. Indicate that you do not know your most previous password. Request a recovery email to the admin%shaunluttin.com@gtempaccount email. Login to admin@shaunluttin.com to receive that email. Then continue with the renaming process. Not the answer you're looking for? Browse other questions tagged youtube google-apps google-account or ask your own question. 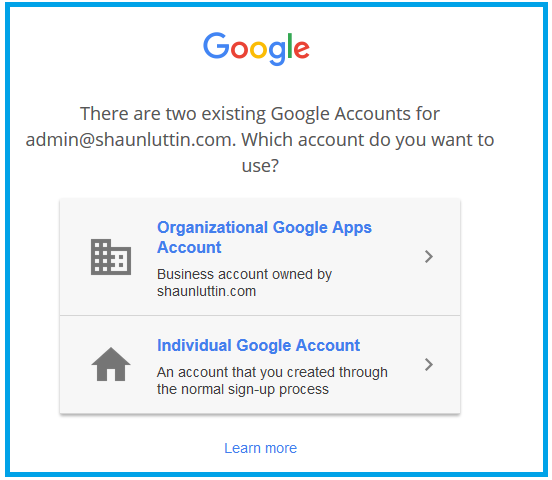 Should I add all my domain names to a single google apps account? Someone's Google account under my domain, how to ask for removal? How do I add a Gmail username without changing my primary username to the new one? How can I sign in to a newly created Gmail account?